Alex comes from the Park Slope / Red Hook sections of Brooklyn, home of The Classics and Jimmy Gallagher original lead singer of The Passions and others. Alex started singing in 1960 on the street corners of Brooklyn hamonizing with friends like Rudy and The Tradewinds - "Careless Love" (Angle Tone Records) 1962 and Reggie and The Remarkables - "The Year That Gave Me You" (Musicor Records) 1962.
out with the LeBron Bros, They were a Hot Latin Band at that time. grew up. Just up the street (St John's place) from him was another hit making group, The Cashmeres - "Satisfied" - Part 1 and Part 2 (Lake Records) 1960. Alex Augustine with the late New Jersey radio DJ Sal Anthony & The Doo Wop Shop. 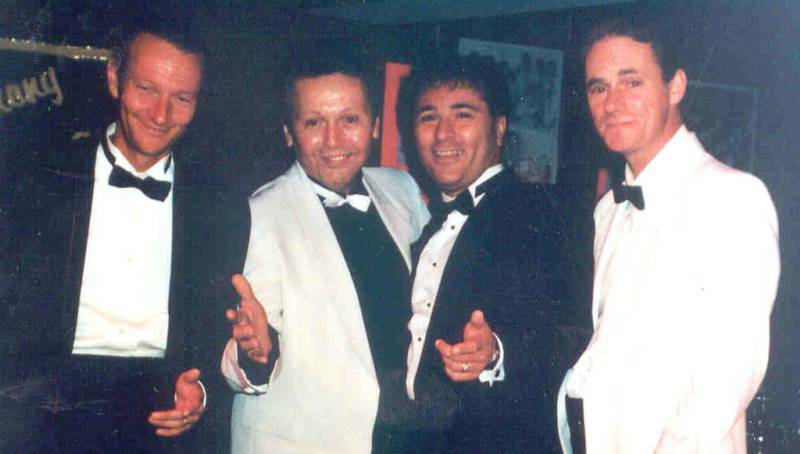 Left to right:Jeff "Skinny" Healy, Sal Anthony, Alex Augustine, "Fast Eddie" Schelhorn.